Here is some information just received this in a newsletter from the U.S. Department of Education. This webinar may be of particular interest to researchers and education leadership. It is sponsored by WestEd, which usually has very high quality education-related resources. This week, we offer two new resources on Increased Learning Time and invite you to the February 20, 2013 webinar on Using Data. The presentation will center on how to use data to inform school improvement planning, and perhaps more importantly, outline a system to manage all aspects of school improvement at the department, school, and district levels. This seamless support structure is simple, yet very powerful, and is being used in urban, suburban, and rural districts with equal effectiveness. Schools often fail in their improvement efforts, not because they don’t plan well, but because they don’t manage their plan’s execution. Join us to see one simple and time effective method that has supported schools to achieve dramatic student achievement growth. To sign up for the webinar, please use the “register now” link in the right sidebar. This policy brief provides concrete strategies to support expanded learning time in schools, such as schools forming partnerships with community organizations to create a cohesive learning day that both supports a longer school day and meets the needs of working parents. Policy makers are encouraged to support initiatives not only to extend the school day or year, but also to expand the way students learn through enrichments and diverse activities tailored to each school’s needs. 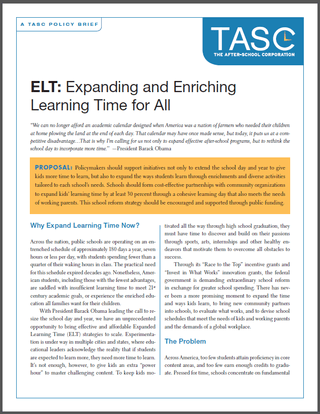 The brief also describes the core elements of the Expanded Learning Time / New York City initiative and discusses lessons learned from the first year of its implementation in 10 New York City schools. 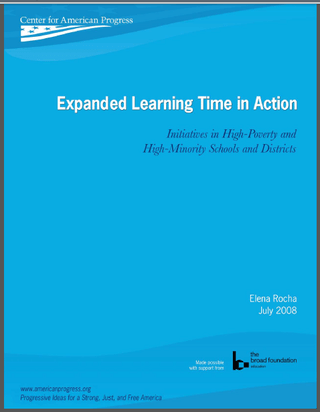 This report examines the revision of school calendars in high-poverty and high-minority schools and districts, including addition of learning time as well as creative strategies to use learning time differently. It identifies more than 300 initiatives implemented between 1991 and 2007 in high-poverty and high-minority schools across 30 states, and offers additional snapshots of school and district initiatives that incorporate additional learning time into the school calendar. These resources provide a basic overview of increased learning time (ILT) programs for users from all stakeholder groups. The policy brief explains the importance of these programs, and highlights a New York City initiative to describe how such a program might be implemented. The second report provides a more in-depth look at the way that ILT programs can be beneficial, particularly to the most traditionally underserved student populations, and lays out components of successful ILT initiatives to illustrate how they achieve this impact. These resources should be helpful for anyone looking to expand their understanding of the components and potential impact of ILT programs. We invite you to join the STLC to participate in the group discussions and receive invitations to new webinars. Feel free to contact us at info@schoolturnaroundsupport.org with any suggestions or questions. The School Turnaround Learning Community provides states and districts with easy online access to resources and networking that enables them to support schools more effectively. This entry was posted in Conferences and Publications, Fixing Education and tagged achievement, Education, improvement planning, increased learning time, K through 12, Research, U.S. Department of Education, United States Department of Education, using data, Webinar, webinars. Bookmark the permalink.